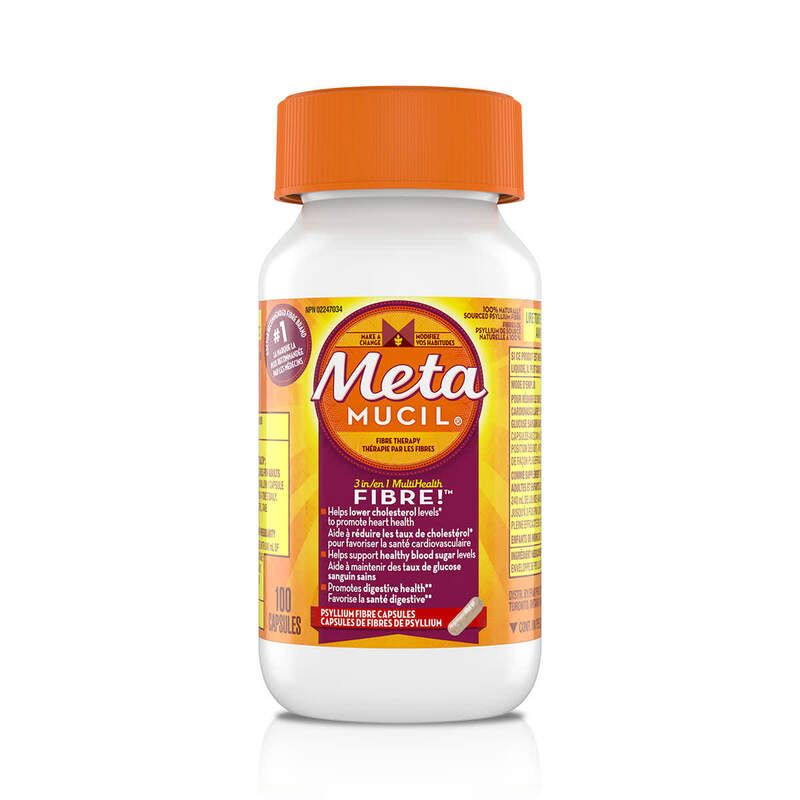 Metamucil Fibre Capsules Plus Calcium is a great way to add fibre to your day and is the only leading fibre supplement brand containing psyllium fibre for multi-health benefits. 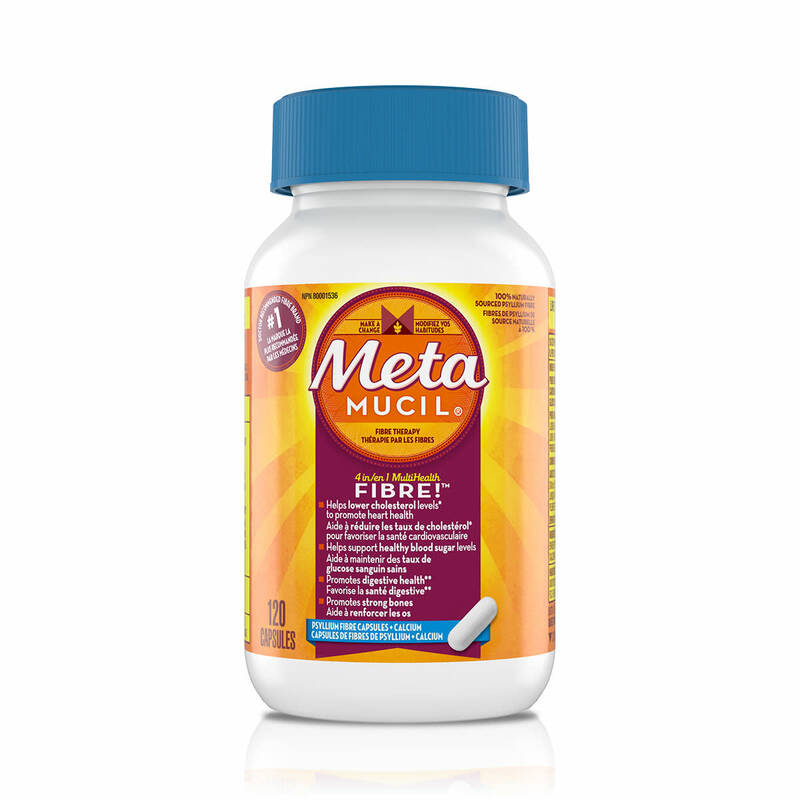 Up the fibre in your diet with Metamucil— a small simple step toward a healthier lifestyle. FOR ADULTS ONLY: 5 CAPSULES WITH 240 mL OF LIQUID (SWALLOW 1 CAPSULE AT A TIME AND TAKE IN AN UPRIGHT POSITION) 4 TIMES DAILY. FOR BEST RESULTS IN LOWERING CHOLESTEROL, TAKE METAMUCIL WITH A MEAL. FOR FIBRE SUPPLEMENTATION OR RELIEF OF IRREGULARITY ADULTS AND CHILDREN OVER 12: 5 CAPSULES WITH 240 mL OF LIQUID (SWALLOW 1 CAPSULE AT A TIME AND TAKE IN AN UPRIGHT POSITION) UP TO 4 TIMES DAILY. GENERALLY TAKES EFFECT IN 12 - 72 HOURS. CHILDREN UNDER 12 YEARS: DO NOT USE. FAILURE TO DEFECATE FOLLOWING THE USE OF ANOTHER LAXATIVE. DO NOT USE IF YOU HAVE DIABETES MELLITUS IN WHICH BLOOD SUGAR IS DIFFICULT TO REGULATE. IF CONSTIPATION PERSISTS FOR MORE THAN SEVEN DAYS, SYMPTOMS WORSEN, OR RECTAL BLEEDING OCCURS, STOP USE AND CONSULT YOUR DOCTOR. THESE MAY BE SIGNS OF A SERIOUS CONDITION. METAMUCIL MAY CAUSE AN ALLERGIC REACTION IN PEOPLE SENSITIVE TO INHALED OR INGESTED PSYLLIUM; IN WHICH CASE, DISCONTINUE USE. MAY CAUSE TEMPORARY GAS AND/OR BLOATING. DO NOT TAKE THIS PRODUCT WITHIN 2 HOURS OF TAKING ANY OTHER MEDICINE. CONSULT A HEALTHCARE PRACTITIONER PRIOR TO USE IF YOU ARE TAKING MEDICATIONS WHICH INHIBIT PERISTALTIC MOVEMENT (E.G. OPIOIDS, LOPERAMIDE) TAKING THIS PRODUCT WITHOUT ADEQUATE FLUID MAY CAUSE IT TO SWELL AND BLOCK YOUR THROAT OR ESOPHAGUS AND MAY CAUSE CHOKING. DO NOT TAKE IF YOU HAVE DIFFICULTY IN SWALLOWING. IF YOU HAVE CHEST PAIN, VOMITING OR DIFFICULTY IN SWALLOWING OR BREATHING AFTER TAKING THE PRODUCT, SEEK IMMEDIATE MEDICAL ATTENTION. STORE AT ROOM TEMPERATURE TIGHTLY CLOSED TO PROTECT FROM HUMIDITY. SEE BOTTOM FOR EXPIRY DATE.